This Saturday saw the launch of Blonde Poker's inaugural Blonde Bash in which members of the Poker 425 Blonde Forum were invited to attend the Broadway Casino in Birmingham for 2 days of fun and frolics. Incredibly, in excess of 100 Blondeites made the journey to the Midlands to participate in what promised to be a fun-filled weekend. After the initial meet and greet process, first on the schedule was the £30 double chance freezout. With 3k starting chips, and another 3k on the substitute bench, there was plenty of room to play poker. Before the tournament commenced, recent television celebrity and poker superstar, Tony 'Tikay' Kendall, addressed all competitors and thanked them for their attendance. Assembling such a field was a massive achievement and Tikay was clearly touched that so many had made the effort to turn up. Coincidentally, Tikay was the very first player to fall. A big cheer signalled his early demise and the old fella was forced to watch from the rail. However, this competition wasn't about the money, in fact, it wasn't even about the poker. The main incentive was to meet all the wonderful people that had only ever exchanged words in cyber space. The very fact that acclaimed players such as Paul 'Actionjack' Jackson, Simon 'Aces' Trumper, Dave 'El Blondie' Colclough, and Malcolm 'The Rock' Harewood' had found time to attend the event spoke volumes. At one point, your reporter recalls Simon stating that he suddenly remembered why he loved this game so much. Rookies playing against pros, men playing against women, old versus young. This was the magic of poker and the reason why so many embrace the wonderful game. As the competition progressed, the bodies in the bar area gradually grew. Your reporter went out at a very early stage. I shall spare you the bad beat story, mainly because I don't have one, but sometimes my own bad play is more than enough to finish me off. One man who greeted me at the bar though was WSOP success John McGrane. Although forced to miss the competition due to an online EPT qualifier, it was great to see the London cab driver in attendance and displayed yet again the vast support that had been garnered for the Bash. During the break, the Broadway provided a free buffet for everyone involved. A fantastic gesture from a casino who had gone to great lengths to make us feel welcome. 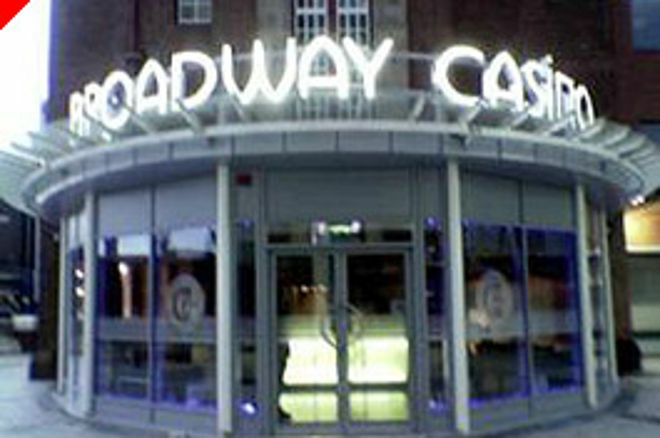 The Broadway Casino is fast becoming one of the country's most respected establishments and all the recognition is thoroughly deserved. Lavish interior, spacious layout, faultless dealers, and beautiful valets. Even the flush in the toilet was touch sensitive. I spent many a moment in there, but that may have been due to alcohol abuse rather than any interest in modern technology. A few hours and many gallons of booze later, the field was whittled down to a final table of ten. The unfortunate bubble boy was NoflopsHomer whose K-J failed to fight off the might of Trumper's T-9 which paired on the river. Moving into the final table, Paul Jackson and Simon Trumper were going great guns, lying in second and third respectively. Slightly further down the list was young gun Ian 'At-It' Bradley who was in last but one position with just over 40k. Several Poker 425 interviews later and we were down to the final 2 with Trumper holding a slight chip lead over Actionjack. Eventually, the two pros agreed to split the money and play for the trophy, a prize which was vastly more important than any banknote. After a brief encounter, it was Simon who eventually lifted the silverware, a moment that will surely live with him for the rest of his days. A top chap and a worthy winner. Although the tournament had finished, the night was by no means over. Whilst the booze continued to flow, the pre-arranged Heads Up knockout tournament was in full swing. Your reporter won his first round match, but was soon put in his place when he lost to second round opponent, Jen Mason. However, being of the female species, it was only right that I should let her win (cough). The Heads Up competition lasted well into the early hours of the morning with the ladies team emerging as the eventual winners, although I wasn't the only one to attempt the 'we let them win' excuse.